I won’t deny it. Pasta Carbonara tends to be one of my favorite dishes on the planet when I’m in the mood for comfort. And my entire family is right there with me, even on picky-eating days. It’s as indulgent as all get out and I am always able to get it on the table in a matter of minutes which is huge. 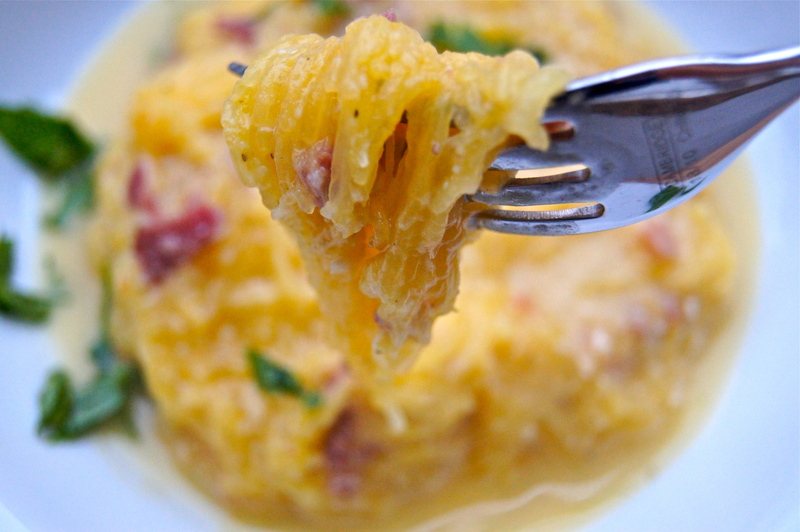 But my little unsatisfied food brain got to thinking….if Carbonara is so delicious and weeknight savvy with spaghetti pasta…why the heck couldn’t it be with spaghetti squash? 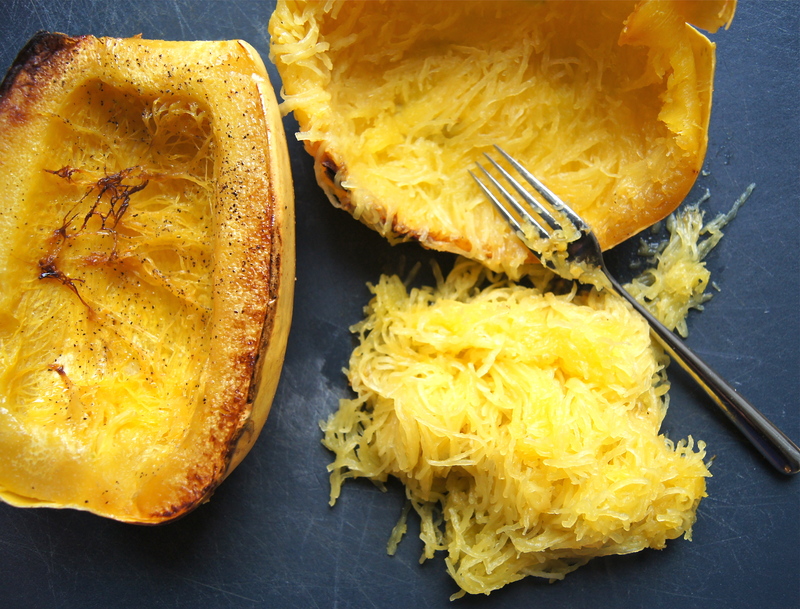 Spaghetti squash and actual spaghetti pasta are not always inter-mixable to me. They have similarities…but are really quite different. The textures are different. The taste is different. For goodness sakes one is a vegetable and one is starch. A heavy starch that doesn’t offer much in the nutrient department. But for Carbonara? I just knew the swap would work. Yes the textures and taste are different…but I felt the nuttiness and slight sweetness of the squash were sure to work well with a rich Carbonara ‘sauce’. I just needed to figure out ratios to complement the texture of the squash. 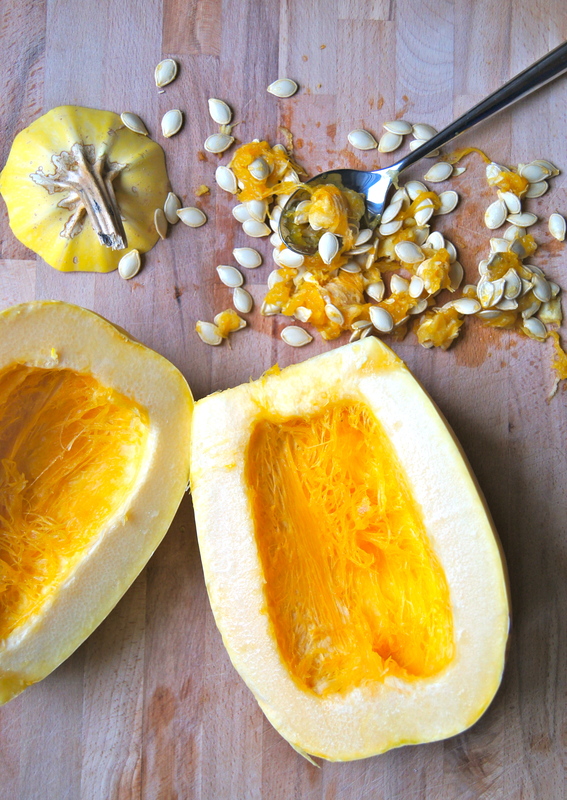 First I tried substituting roasted squash 1:1 for the pasta in my favorite carbonara recipe. Didn’t cut it. Good, but too much liquid, too much cheese…and WAY too much richness; I know, I had no idea that was humanly possible either. But after a few more stabs at it I’ve got it down, and I’m happy to deliver it on to you. It’s decadent. Smokey. Rich. As comforting as a warm blanket on a cold day. And tricky-because your kids won’t miss that pasta one bit. Simple, yummy and real-3 is totally company. Perfect, chilly weather, weeknight company. Preheat oven to 425 and line a baking sheet with foil. 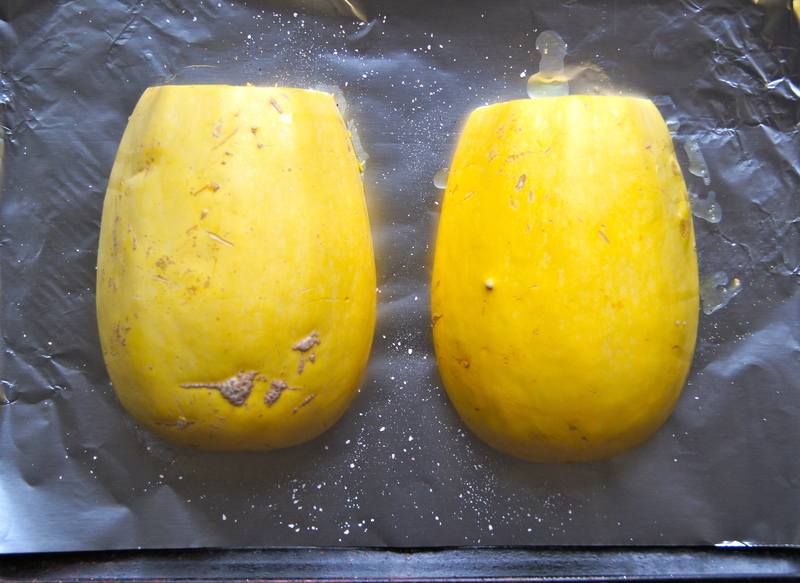 With a sharp knife, slice the stem off the squash and cut it in half lengthwise. Scrape out the seeds with a spoon and discard. Drizzle the olive oil over the cut sides of the squash and rub it in with your hands to cover the flesh. Rub garlic clove all over the flesh, discard the clove and sprinkle with salt and pepper. Place on prepared baking sheet, cut sides down, and roast for 30-40 minutes or until very tender. Remove from oven and scrape out the flesh with a fork; set aside. Heat a large skillet over medium high heat. Add pancetta or bacon and cook until browned, stirring often. While bacon is cooking beat the eggs and parmesan together in a small bowl until well combined. 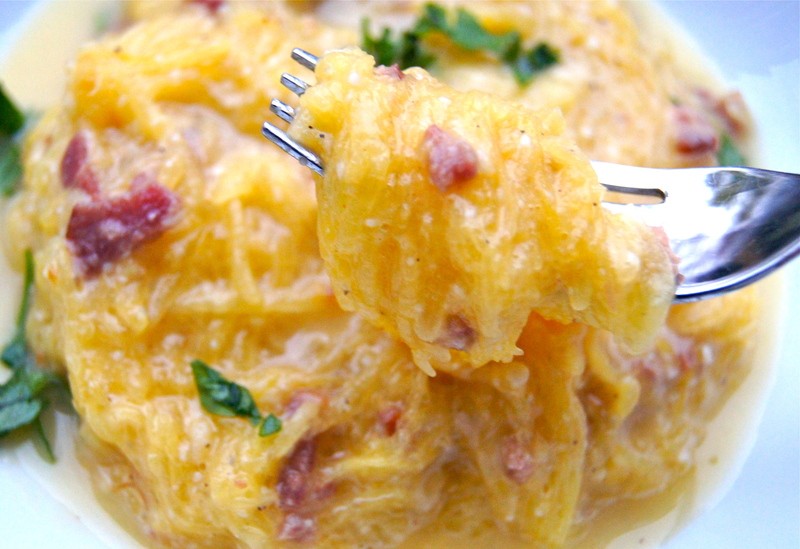 Once bacon is browned add the spaghetti squash to the pan and toss with the bacon/drippings to coat. Remove pan from the heat and add egg mixture, stir well to coat the squash (stirring quickly and removing the pan from the heat source will ensure the eggs will not scramble and will form a beautiful sauce). Season with salt and pepper to taste, garnish with parsley and serve. Serves 2-4 as a main course. This sounds so good and looks lovely! Beautiful photos, recipe looks so yummy! thank you so much, so nice to have you stop by! I saw this posted on IG and had to try it – a healthier version of pasta carbonara?? Genius! !